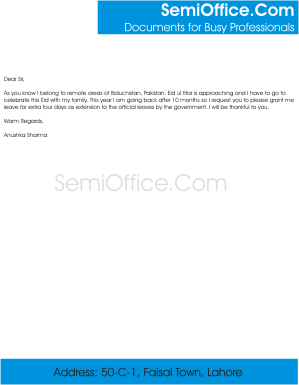 Sample Leave application for Eid Holidays to get extensions with official holidays. These samples can be used for to go abroad for celebrating Eid or similar events. This application can be used as leave template on Eid ul Fiter and Eid ul Azha and extra leaves for attending marriage etc. For more leave applications visit here. I won’t be able to come after Eid for four days. I have to attend engagement ceremony of my best friend on 7th day after eid most likely to be on 16th Aug. I request you to grant me leave after eid till 16th Aug. I will be thankful to you. I won’t be able to come to office after the Eid-ul-fitr for seven days. I am going abroad (Out of UAE) to celebrate this Eid with my family. I can’t confirm the dates but my leave wouldn’t exceeds the seven days. Please do let me know if I need to join the office earlier after Eid at your earliest convenience. I won’t be able to come before Eid for two days. I tried contacting you yesterday on cell phone but I didn’t have any contact number. I found this email address in the file for the Ambassador Program so I am mailing you through this. Please do let me know when should I join the office after Eid at your earliest convenience. As you know I belong to remote areas of Baluchistan. Eid ul fitar is approaching and I have to go to celebrate this Eid with my family. This year I am going back after 10 months so I request you to please grant me leave for extra four days as extension to the official leaves by the government. I will be thankful to you. I am student of BSc Social Science in London College of Social Studies. I am Muslim and studying here as overseas student. The most famous Eid festival of Muslims is in next week and I want to go home for celebrate this festival with my family members. I request you to please accept my leave application for two weeks, so I would be able to celebrate this Eid with my parents and siblings. I will be thankful to you. I would like to request you that I need a leave for three days from 25th-26th of September .As I know that I am a Muslim and I celebrate Eid ul azha with all my joy and happiness!!!! !